Singing is often practiced to help HAPPI Farm’s participants relax before or during their ride. Everyone at the farm is encouraged to sing along while students enjoy demonstrating their new riding skills. 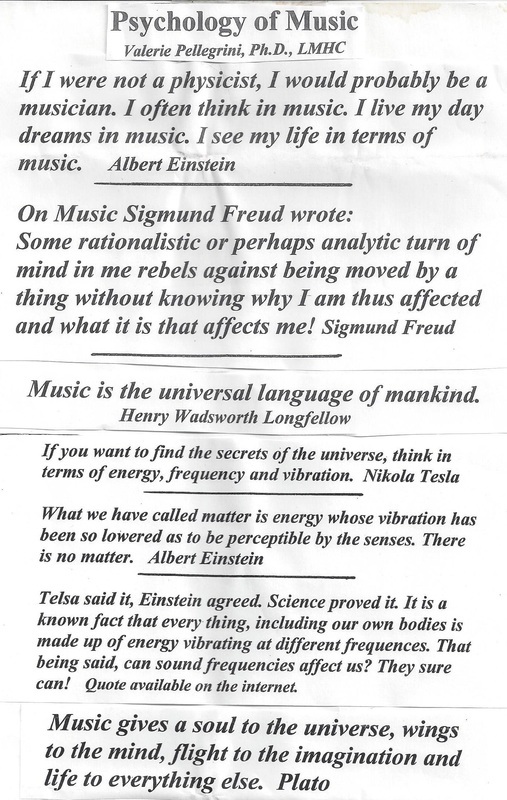 Our participants have shown wonderful progress when music is added as a teaching tool. When offering music as a therapeutic aid, I was deeply encouraged as the outcome coincided with research results from Dr. Oliver Sacks in his world renowned book, Musicphilia. As one young boy with Autism, at the age of 7, sat on a bench at HAPPI Farm, who had not been able to respond to the many loving efforts to raise his interest or enthusiasm, I approached him holding my guitar. I asked if he would like to sing. He did not respond and only continued to glance down at the grass beneath him. So as I strummed, I spoke, “How would you like to play the guitar? I can show you… it’s fun… watch.” I placed the guitar in his lap and showed him how to strum. He smiled, looked up and began to move slowly. I took the guitar back and as I played he got up and began to dance back and forth to the music. His mother had tears in her eyes as his energy reached higher levels and as his enthusiasm with music continued. In another case, a boy at the age of 8, did not speak, and rarely if ever expressed himself. To my amazement and that of his parents, when I played only the music of the song “You are my Sunshine,” he actually began to sing the words! In the past at the psychiatric hospital, when a patient saw me leaving with my guitar he said, “Ah, I always wanted ta play, but I ain’t got no talent.” I said, “What if I told you you’ll be playing this guitar in the next 4 minutes.” He answered, “No way, no way!” I put the guitar straps on his shoulder and I said, “Put that finger on the first string, third fret… Go ahead, strum.” “Well, don’t ja need one of dem picks?” “No I answered, just strum.” He did and I chose a song that required only one note for several sentences… “This little light of mine, I’m gonna let it shine…” and “He’s got the whole world in his hands…” He was infused with a surge of energy and he cried out, “I’m playing-I’m playing!!! !” Well I took him then to the room in the hospital and we chose a booklet with songs he knew, and which had the notes typed above each change of tune in the song. One and half months later, as I was leaving the hospital, he came out of the room, playing a great song of his own. 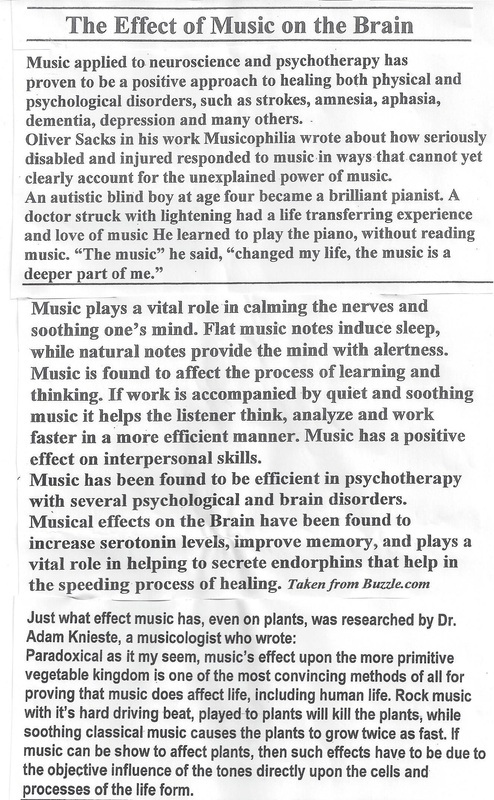 He said, “I’m playin, I’m a singer, I’m a writer,--I’m a musician!” “See,” I said, “I told you!” Music on the mind has such a powerful effect on us!